ROFLMAO - Marcy made me a ICANHASCHEEZBURGER! 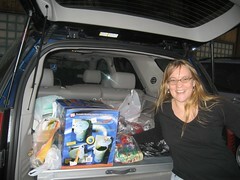 What do you get a Rocket Scientist for Christmas? 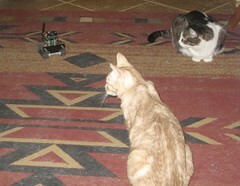 Why, you get him what he wants -- a robot to chase the cats with! 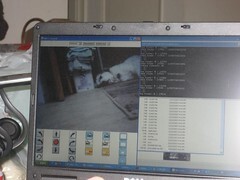 Here's the link to the bot at Surveyor Corporation. 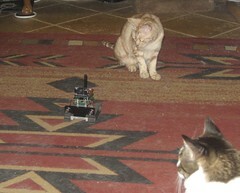 This little bot is very cute-- even the cats were amused. 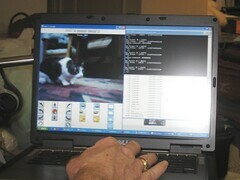 This is the Roketman's laptop, showing how he controls the bot, and what the bot sees with its on-board camera. 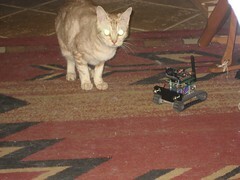 The bot has laser eyes, which Ginger really loves. 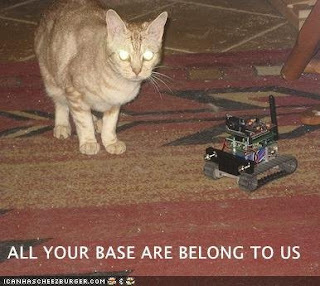 She's definitely a laser-dot chasin' cat. Jalinda wasn't very amused by the bot. This is the only picture I got. 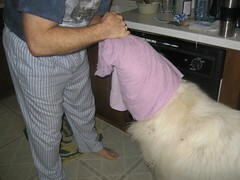 After this, she refused to be in the same room! 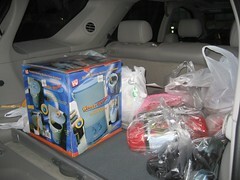 Jez and I went shopping to Marukai in Gardena yesterday. 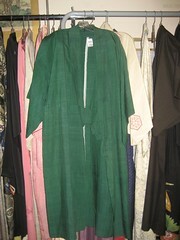 I spotted this gorgeous green kimono upstairs in the antique section. It's unlined, and obviously hand-sewn. 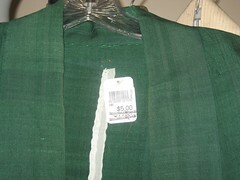 When I saw this price tag, I had to go ask a clerk to make sure it wasn't a typo! That box is a portable washing machine. It should be awesome for doing Judith McK's "yarn abuse"! A very few hours before this was taken, and the day before we originally would have left on the road trip, Rex was a very handsome dog just back from the groomers. And then there was a skunk. 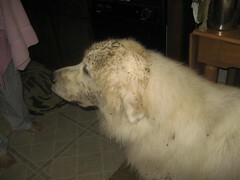 And after that, much rubbing of the muzzle in the mud to get rid of the odor. When Mom and Dad realize what's happened, it's right before bedtime. 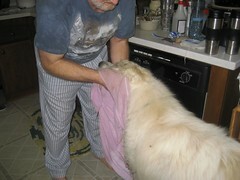 Dad grabs a towel, Mom grabs the camera. And there was much consternation. Four-footed, and two-footed. Mundacities? I looked it up, it is a real word, based on mundane. That sumarizes my life right now, and that's just what I want. The Roketman and I backed out of driving back to Hays Kansas (where my mom is) and then on to Omaha for Poor Little Dale's 80th birthday party. From the looks of the weather, we made the right choice!! Mom says they have thirteen inches of snow down on the ground, which is really unusual because that part of Kansas is so flat! Snow usually blows on over to the east, where there are hills and trees to catch it. When you talk to your supervisor at work to try to solve the dilemma, and she talks about how all the other librarians are going to the national conference... you get a pretty strong clue to her preferences for your time. Let's see if I can find my original point in blogging, okay? I have a few goals for this holiday season. Let's list them here, and try to keep track. You have been warned of the mundacity, but keeping myself real is part of what this blog is (supposed to be) about. Two batts' worth of white Romney, no specified purpose except dyeing. Carded and spun into singles so far. A pair of socks- yarn is from Phebie's, yarn is "Happy Feet", label says "Spun in Peru for the Plymouth Yarn Co."